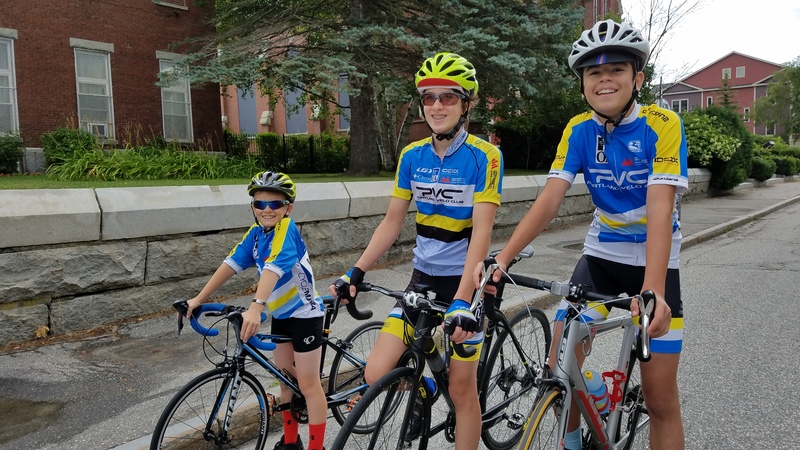 Posts | Portland Velo Club | The largest cycling club in Maine. Tuesday, March 6, 2018 @ Bruno’s. Start your season with friends. Join us! This entry was posted in Club News on March 5, 2018 by Nathaniel. 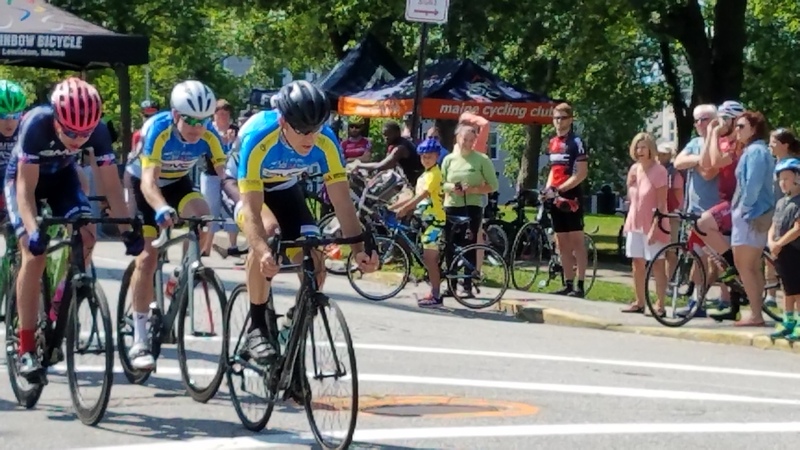 There was a great PVC showing at the Auburn Lewiston Crit today! Three of our junior were there to represent with Aiden Simmons finishing 1st followed by George P Theall for 2nd and Everett Yannelli in 4th! Aiden continued on in the challenging 4/5 field to continue to gain additional experience. The wind swept in after the first race which literally blew the remaining fields apart. It reminded me of the Track race called a “miss’n’out” where each lap the last person was pulled from the race until the finish. The fields were not large but fast and challenging. The 4/5 race Mark Carpenter and Peter Morrison were working hard in the field finishing 4th and 7th respectively. The 35+ race Peter was back out there and finished 3rd. The 50+ race had 2 people off the front almost from the gun. The field continued to loose people as the gap with the leaders grew. George A Theall burst out of turn 3, up the hill, skipping his wheel in turn 4 for a clear field sprint win for 3rd place. Carl Hitchcock also stayed with the field winning a few primes along the way. Others racing the PVC colors include Chris Darling, Graydon Stevens, George Benington, Brook More, John Baldwin, Brian Cole, Paul Niehoff, Christian Ratliff, Dan Leland. 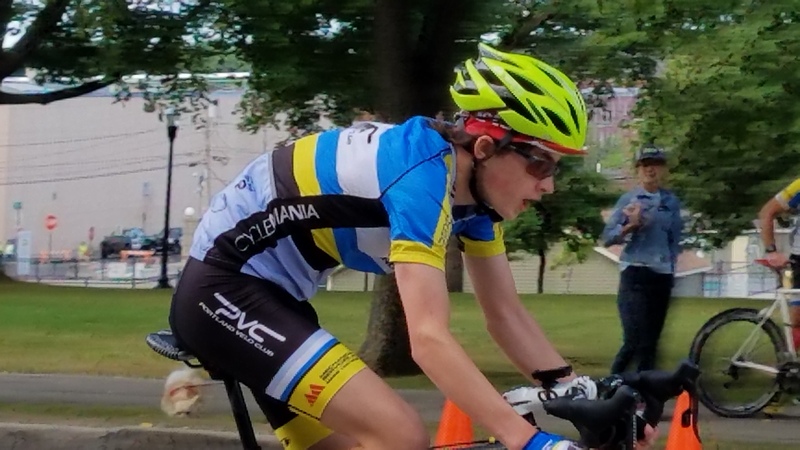 This entry was posted in Club News, Racing and tagged Bicycle Racing, Criterium, Portland Velo Club, Racing on August 7, 2017 by Nathaniel. In efforts to increase the safety of the peloton, pedestrians, traffic and all; the SMR will depart sharply at 7:00 am for the Peak Summer months of July/August starting THIS SATURDAY, July 1st. This is inclusive of both the men’s and women’s rides. This is the ride we all look forward to every week and I will continue to work with the local towns to keep this ride as safe as possible for everyone … riders, walkers, runners, motorists, etc… We appreciate that Scarborough PD reached out to us to make a suggestion and are willing to work with us to ensure safety for all. They, as well as many others, love to see us parade through their town. But Safety FIRST! Let’s all ride smart!!!! Thank you for your understanding. See you at the start this Saturday, July 1st, 7:00am. 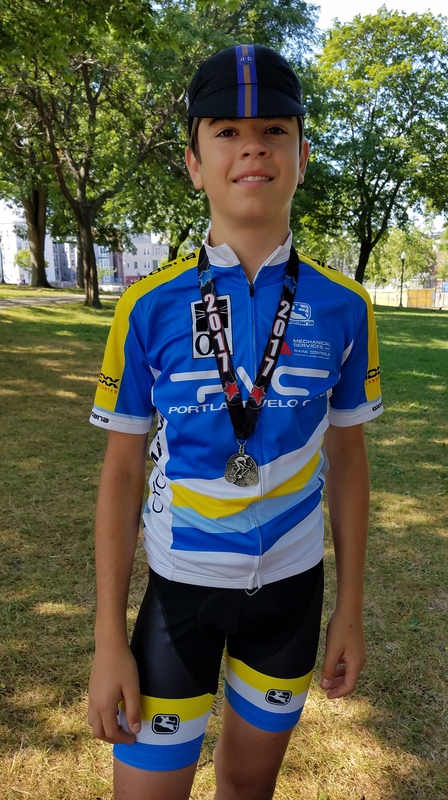 This entry was posted in Club News, Group Ride and tagged Portland Velo Club, Saturday Morning Ride on June 29, 2017 by Nathaniel. We had a good crew from Maine at CX Nationals this year since it was so close to home, and folks are just really getting excited about cyclocross. The sport seems to keep growing by leaps and bounds, and it is funny to see both the Junior and Master fields overflowing with participants. The Hartford Course was in a small park on the shores of the CT river. The area features some fields, a large earthen levee that was about 40 feet high and some small woods trails in the river bottom mud. Part of the course went through a gazebo and playground. I went all out this year. I mean I love CX, but this year I went a little overboard with racing. I essentially raced more days than most pro racers. In retrospect, I over did it. Racing every weekend since the end of August has cost a lot in terms of free time, training and money. I set out to do the whole schedule for New England. Pretty much all weekends except Labor Day, even a midweek race. It was important to me to try to get on the Hartford course earlier in the year, which I did. The national course, while not following exactly, was in a lot of the same terrain. 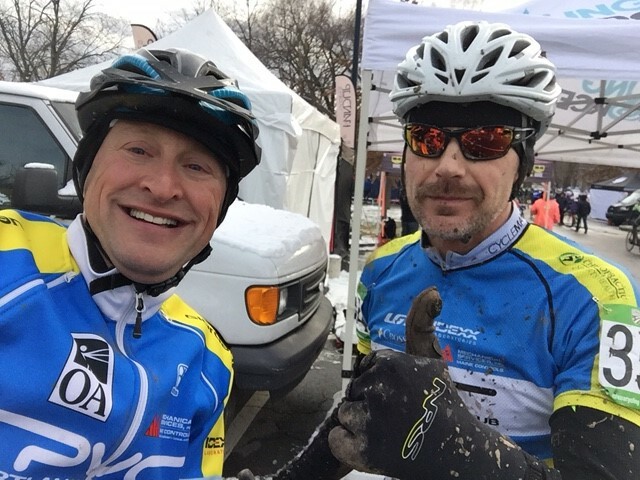 With 2 weeks after the last Connecticut snowy races in Bethlehem and New Haven, I felt pretty good about having raced 2 full days in snow and then got some training days in on the road with snow. I knew Hartford could dish out some snow and ice. 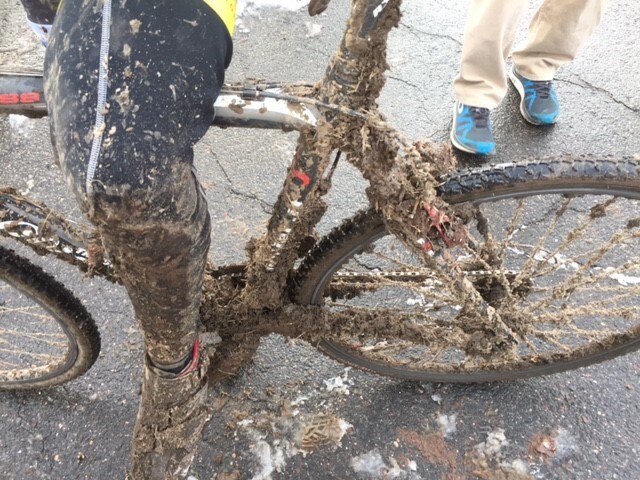 But the conditions early in the week at nationals looked like frozen mud to slippery mud. Changing fast each day. If you have not seen the video of the large slip and slide hill (that they eliminated later in the week) check it out here. I got on course on Thursday, and things were in really descent condition in that all the mud was solid as a rock. There were a few good lines on the course, but really hard ruts that they had made some attempt to smooth with a ATV. Then it started to snow late in the evening, and I knew my race was going to be hard. The next morning it was those same frozen ruts but you could not see them because they were covered in a few inches of snow. This made the early races really difficult to say the least. Brian Cole raced in the AM and ripped a derailleur off his bike. These frozen ruts could flat a tire in an instant. By the time I was set to race, the conditions had changed to surface mud. I got on the course for several lap,. and it was treacherous. Now the frozen ruts were not visible, and the snow was melting enough to make all sections of the course slippery beyond belief. I lined up just after noon and was ready for a good technical race. However, this was a bit more. I love racing in snow, but ice and half melted frozen ruts are another thing. This course was a bit scary in that a fall on this stuff could break your wrist, arm or leg. No joke. We raced off the line and across the first turn, and it was going well. Into a straight away by the pits, I immediately hit a hidden lengthwise rut that took me out like I was not on a bike! Flat down, hard ouch. Got up and tried to see both the bike and me, both were ok, but a bent shifter had to be fixed. Getting back on the bike, I was off the back of the pack, who were now going into a long diagonal off camber run-up that you could ride on the bottom for a way or along the top. It was really a hard run with mud, ice off camber. The big downhill caused everyone to pause a bit since it required leaning away from the hill, and an off camber turn then braking enough to not get caught in the exit ruts. Pretty scary for some folks since you could really injure yourself on the flat at high speeds. I negotiated that hill well, but it was the woods section after the pits that were probably the second most difficult. The frozen ruts in the woods were unbelievable. It looked as if they raced hundreds in the mud and then left all ruts to freeze solid. Just the width sometimes of a 34 c tires. It was really hard to negotiate the small uphill’s and tight turns in the woods. Many spilled or ran their bikes here, but even running was dangerous. An ankle twist was very easy. I was glad to be wearing my Lake high ankle winter boots for both support and warmth. A few laps in and I was still off the back. This course had no place to go really hard, and it was truly a course of attrition. The person who made the least spills and recovered fasted would win. There are so many places to have slip ups. Even the pro field experienced the same thing. I ended up having one other dump in the woods that caused another loss of time that really put me back. I ended up finishing way in the back ¾ of the pack. On the last lap, the leaders came through and started lapping the back of the field. In retrospect, it was a fun experience but not what I had planned for. The conditions made the course more challenging than I had expected, plus the goal of not getting injured again. I had several injuries this season and did not want to repeat. Luckily I didn’t. I also saw the great advantage disk brakes could have offered me on parts of this course; my carbon rim brakes did not work well on the frozen downhills and mud. The really good things was that I got the best hotel room, within a short 10 minute ride of the course. This made the post-race cleanup easier. It was so easy that Hank Pfeiffel and Troy Barry hung out there and kept warm before Troy’s race. PVC had some good racing that day including: Nathaniel Smith, Brian Cole, Adam Lampton, and Chris Darling. It was great to see most racing! It was a fun season but I am glad to be on skis now! I look forward to the PVC racing team next season! Allen Starrett in a tight turn. He did a great race! Troy Barry (center, upright) on the line with Adam Myerson the eventual winner. 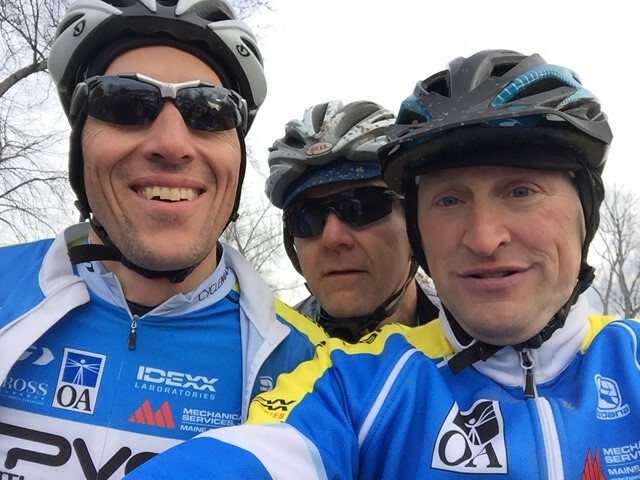 Chris, Fergy, and Paul after racing. What a bike looks like with freeze-dried mud. Hartford skyline over course on CT River. 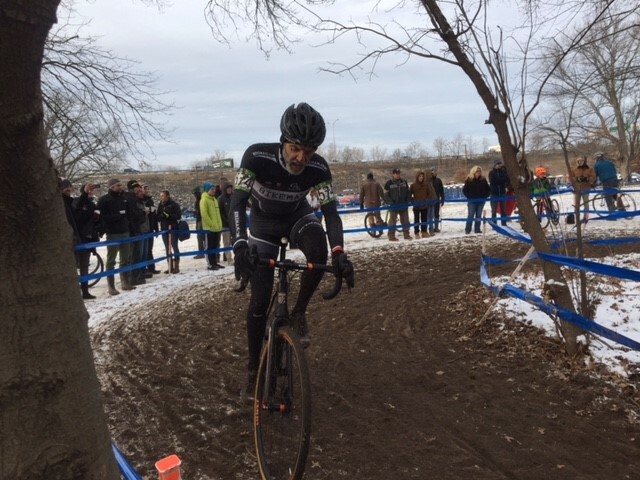 This entry was posted in Club News, Cyclocross, Racing and tagged Cyclocross, Nationals, Portland Velo Club, Racing on February 12, 2017 by Nathaniel. 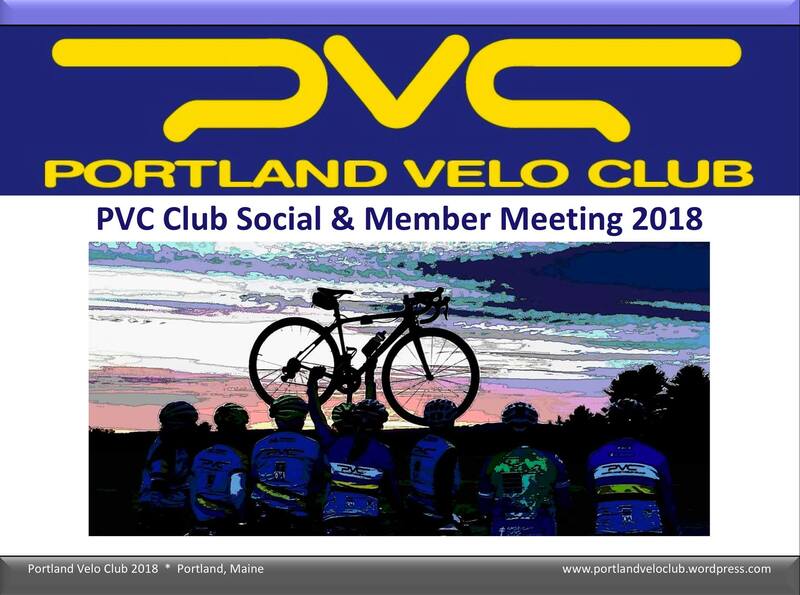 Spring into the 2017 cycling season and attend PVC’s annual meeting and club social on Wednesday, March 1 from 5:30-7:30 PM at Easy Day in South Portland. Re-connect with friends, talk smack about the coming weekend’s first SMR of the year, and enjoy complimentary food and beverages. Mostly social, the Leap Day event will also include some club business in the form of our annual meeting. We’ll be brief. Oh, and there will be really cool door prizes for attending members. Haven’t renewed your membership for 2017? Renew here. RSVP to president@portlandvelo.com or on Facebook. 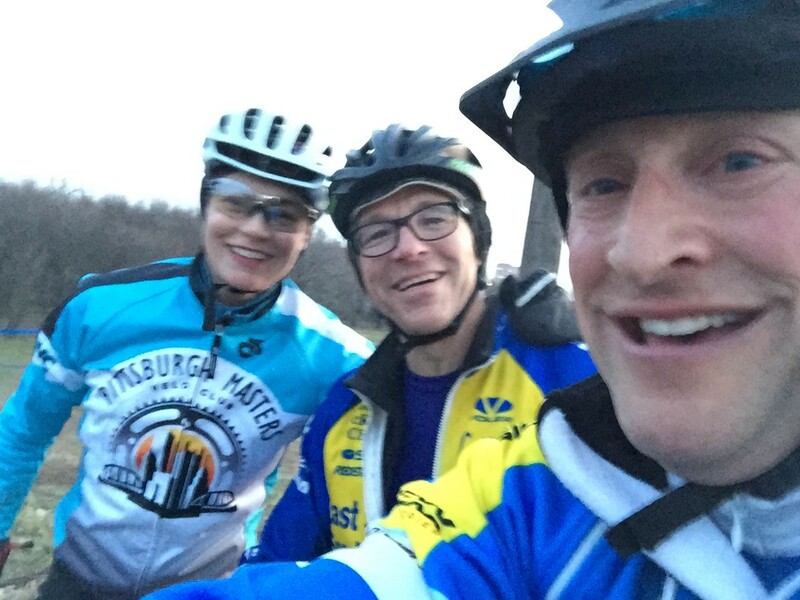 This entry was posted in Club News and tagged Annual Meeting, Portland Velo Club, Social on February 12, 2017 by Nathaniel. CX End of season update before Nats. Last weekend was a good way to end the racing season before Nationals in January. Saturday was an epic with over 6 inches of fresh snow in an orchard in Western CT. I do not think that the promoter was ready for the race since they did not clear the course at all (not that you would clear it that much, but at least a little). We had to try to ride in the fresh snow. Luckily I got in the night before since the driving was really bad. I got a single lap in on the course, which was just about unridable. Not sure how much that helped me but, off I was to line up with high winds, blowing snow and lots on the ground. We all lined up and some were off on their bikes and other decided to run from the start line. You could only ride the flat or downhill parks, and even some of those were unridable. The course had been shortened since I warmed up on it since the conditions were so slow. We were to ride 45 minutes. The course went through an apple orchard and then through some corn fields, with a few hairy descents. Here is what I learned: carbon wheels and caliper pads do not work in the slightest in wet snow. I had to descend these sections, with skiing skills, like aiming for deep snow to slow down! Folks were even running the downhill now. Well just to say this was a unique race, I ended up running about 75% of the course, as did most riders. 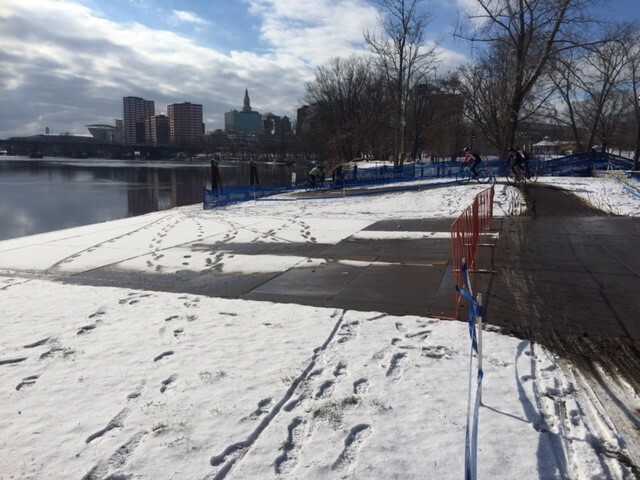 Sundays race in a city park in New Haven was better in that you could ride the whole course even though the snow was still melting off. It turned out to be a muddy adventure with one kind of difficult downhill (no brakes again). Survived that descent each lap and did a reasonable race. This race was really helpful to get the snow and ice racing skills ready for Nationals. So very glad to have done it. That was the last of I think close to 30 races this season, starting in August just about every weekend but labor day. It has been a mixed season with some significant injuries that caused a lot of issues with training and performance, however, it was a lot of fun. I won all kinds of money, gained great notoriety and look forward to driving my new race car that I won……..ok I will keep trying. Really, I did a few races I was proud of, that will keep me motivated for next season! I look forward to Nationals in Hartford CT in a couple weeks. We should have a pretty good PVC and Maine turnout. I will race on Friday in the Master’s and will stay the weekend to watch the Junior and Elite races. It will be nice to just watch someone else race for a change and then look forward to a good ski season! 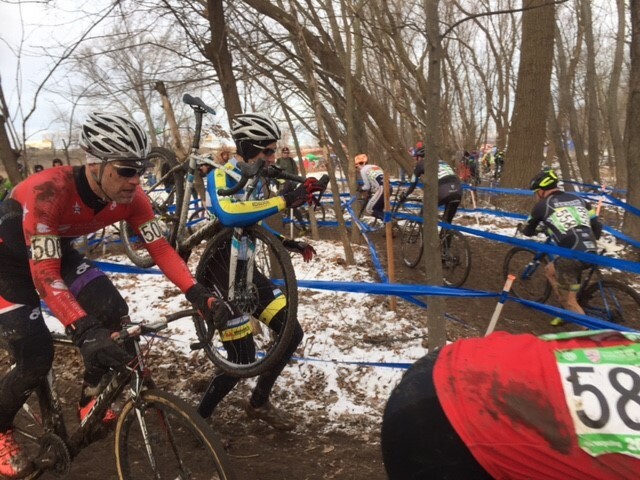 The March Farm Cyclocross, see how some are riding and some running…for the whole course…. 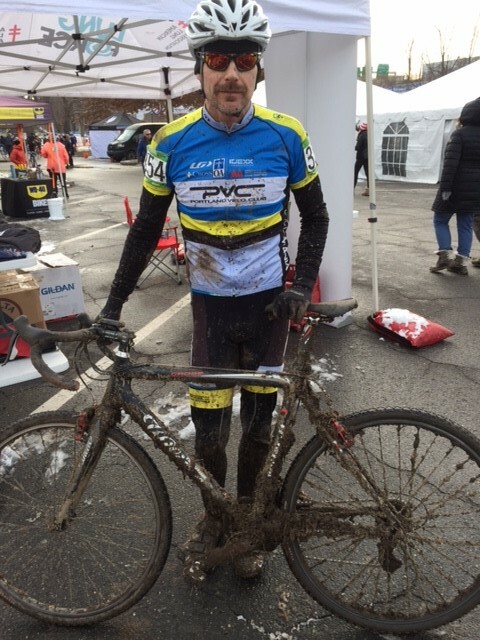 Getting Ready for the Elm City Cyclocross in NH CT.
Post race mud and enjoyment at Elm City CX. 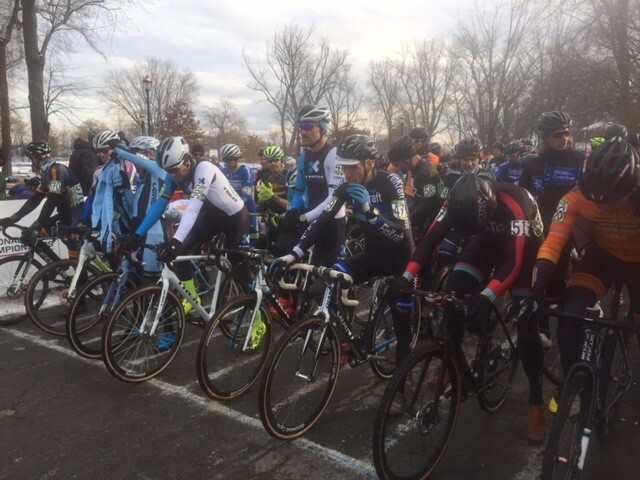 This entry was posted in Club News, Cyclocross, Racing on December 27, 2016 by Nathaniel. On Wednesday, November 16, PVC announced its new race program for 2017. Approximately 30 members of the club were in attendance, as race organizers Ted Darling, Linda Braley, Paul Weiss, Kevin Woodhouse, and David Brink outlined the program. Interested members will need to (a) renew/become a member for 2017 and (b) complete the online form indicating the races in which you will compete by January 31, 2017. (Note that there is a 5 race per discipline minimum for each discipline in which you intend to race). Race exclusively for PVC during for 2017, including wearing the PVC team kit while racing. All Bikes and Helmets will need to be submitted and Paid in full by January 31st (and cannot be ordered during the season) to assure delivery in time for the season. It would be great to get the Stages order in at that time as well but we can do Stages orders in-season. There are about 35 trail races in New England each year starting in April and ending in October. These races range in both difficulty and length and are great for beginners as well as experts. 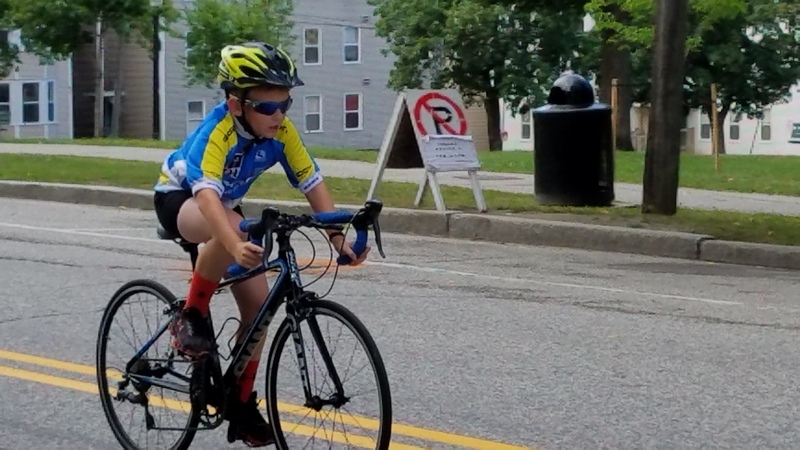 The PVC Mtn bike race is targeting these 10 races in New England that represent the full range and level of difficulty offered. 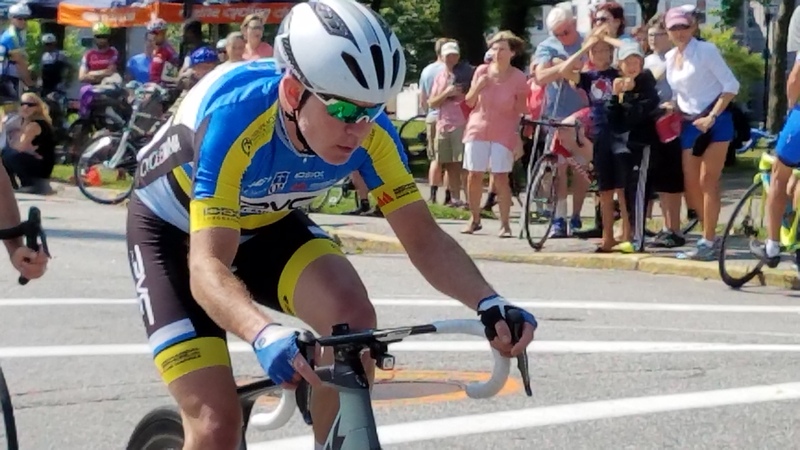 With the importance of supporting local races, this list emphasizes those races held in Maine. *You may use two (2) Scarborough Crit Races against your minimum race commitment. 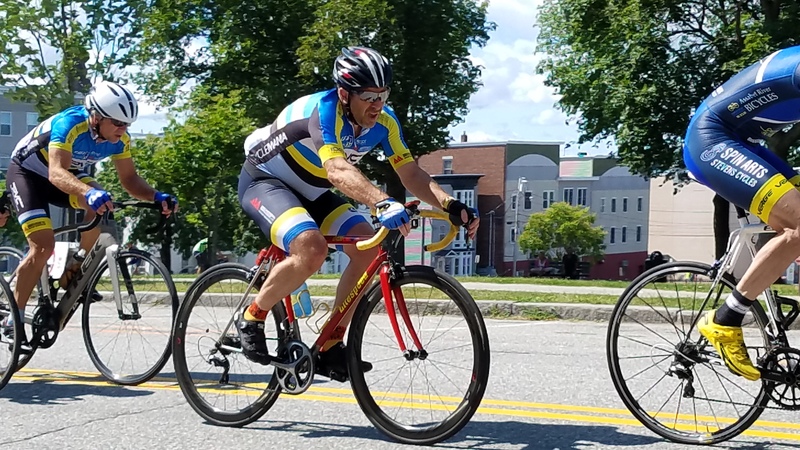 **You may use two (2) Maine Time Trial races against your minimum race commitment. 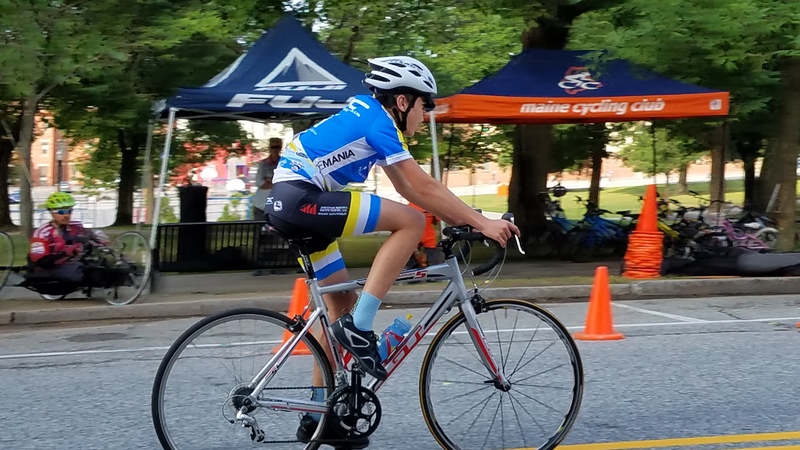 This entry was posted in Club News, Racing and tagged Bike Racing, Portland Velo Club on November 28, 2016 by Nathaniel.